​Brody is our 7-year-old who is the sweetest and most loving little boy. We wish everyone else could know him like we do. He is more than just shy. He doesn't know how to open up and talk to people. He buries his head into us when someone approaches him. Brody cannot go a day without having multiple meltdowns. We do not dare go out to eat with him, as this will always be a battle. The grocery store is another place we dare not venture with him not only for his meltdowns, but because Brody is a runner. We have tried to take him before and he has bolted. He has no fear of danger. He does not understand the concept of danger. We have child locks on all doors and windows on the car because he has tried to go out of them even while driving. He has run away on field trips at school. Brody has no friends at school. He has never been invited to a birthday party or playdate. He has developed imaginary friends over this. Other kids make fun of him on the playground for wearing his headphones. We are heartbroken for our boy. ​Brody was also diagnosed with Sensory Processing Disorder. This makes it even more difficult for him with daily situations. He sleeps with six blankets on him no matter the weather. He wears headphones for sound control. He has five older siblings that no longer live at home. They all have to call well ahead of time to let us know they are coming to visit so we can prepare Brody. His teachers have to let us know ahead of time if there will be a substitute teacher so we can prepare him. He has such high anxiety that he has never gone to the bathroom alone, even at school. He tells us he doesn't want to be alone. It is quite exhausting to constantly be walking him through the house or preparing him for any change that may occur, but it is more heartbreaking to see him not understand why people look at him differently and won't be his friend. 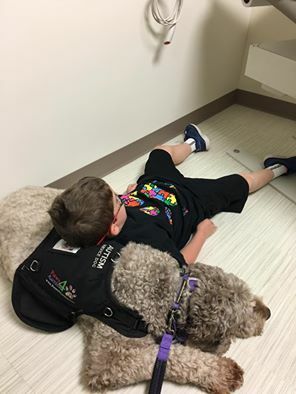 We hope a service dog will help him with his anxieties, break a communication barrier and make a friend. Please consider helping us help our sweet boy. ​Since the arrival of Boyd in our house, things have dramatically changed for our family. Brody's anxiety has gone down significantly. He will now go to the bathroom and walks through the house without one of us because Boyd goes with him. With Boyd, Brody has not tried to elope! Boyd is trained to get him up in the morning by pulling his blankets off; by Boyd doing this, Brody is excited to get his love from his baby and gets ready without his previous hour long meltdown over going to school. We have gone on numerous outings to stores and restaurants without significant problems. Brody calls Boyd his best friend and it melts your heart. To see their bond and the changes in our son makes us forever grateful. Boyd and Paws4Autism are blessings in our life!